When I was a child, my mother would always buy a few pomegranates when they came into season, even though she couldn't really afford them, and she and I would share the jewel-like fruit. There was only one problem. My mother believed that the seeds, like grape seeds, were inedible, so we would chew the juicy pulp off and spit out the seeds. When I was on my own, I thought wistfully of those pomegranates, but didn't want to deal with the piles of gnawed seeds, so I never bought any. Now I know better. You eat the seeds, of course! In addition to being delicious, pomegranates and their juice contain very high levels of antioxidants and vitamin C, and have been the subject of much research over the past few years. ... Researchers report that [pomegranates] are rich in antioxidants that can keep bad LDL cholesterol from oxidizing (American Journal of Clinical Nutrition, May 2000). This degradation of LDL seems to be an initial step in the development of atherosclerosis. In addition, pomegranate juice, like aspirin, can help keep blood platelets from clumping together to form unwanted clots." Research has also suggested that pomegranates may have possible health benefits in preventing prostate cancer, breast cancer, skin cancer, and helping osteoarthritis sufferers. Pomegranate juice tastes so good that when I get my hands on a bottle of it, I end up drinking it before I can even contemplate using it in a recipe. The same was true of the whole fruit until I was recently given a large number of pomegranates. Here is what I did with one of them. Make the mustard sauce by mixing the ingredients listed, in a small dish. Set aside. Toss the cauliflower with a tablespoon of olive oil in a heavy ceramic baking dish or cast iron pan. Roast in a 450˚ oven for 20 minutes. Stir and continue roasting until softened and starting to brown around the edges. Meanwhile, in a wok, stir fry the tempeh in one tablespoon olive oil. As it cooks, sprinkle evenly with one–two teaspoons tamari and turn frequently. (Be careful when adding the tamari. It can splatter.) When the tempeh is starting to brown, add the mushrooms. When the tempeh is browned and the mushrooms are cooked, stir in the raisins and remove to a bowl. Add the kale to the wok, cover and steam in the water left clinging to the leaves from washing. (If necessary, add one or two tablespoons water to keep from burning.) When the kale is bright green and tender, add the tempeh and two tablwspoons of the mustard sauce. Toss the cooked pasta with one–two tablespoons olive oil and the remaining mustard sauce. Place the cooked and seasoned pasta on a large, oval serving platter. Mound the kale and tempeh along the center. Surround the kale with the cauliflower. Spread the pomegranate seeds over the top of the kale. Cut off the flower end. Make five evenly spaced shallow incisions in the skin from the top to the base. In a large bowl of water, break apart the fruit along the incisions. Push out the seeds with your fingers. The seeds will sink and the membranes will float. Remove all the skin and membranes and drain the seeds. My dog has high cholesterol. I've never known a dog with this problem; nor did I know that dogs were even tested for such things. She went to the vet for a couple of other complaints and received "routine" blood work to check her kidney function and such, as she is an older girl. We think she is 15, since her paperwork said she was three when we adopted her from the Humane Society 12 years ago. We didn't know the actual day of her birth, so we gave her the same birth date as our other (now deceased and sorely missed) dog, Starr. Anyway, the vet now wants to do a fasting blood test to recheck her cholesterol. In dogs with untreated high cholesterol, the cholesterol can be deposited in other organs, particularly the eyes. Buff has cloudiness developing in one of her eyes which had previously been contributed to age-related cataracts. Now the vet thinks the cholesterol could be a factor. We'll see. Her reaction to the news was understandably irate. "Just give me more carrots," she said. "And I'd be happy to consume almonds and walnuts if you people would let me." In addition to the high cholesterol, she also has a slight heart murmur. Of all the indignities, her fast began on Thanksgiving, and ended today after her test. What could I do but bake her some dog cookies? UPDATE: Buffy is now on thyroid medication (for hypo-thyroid) which helps to control her cholesterol. In a medium bowl, mix together the flour and yeast flakes. Add the liquid ingredients to the dry ingredients and mix well. Drop by small teaspoons onto a lightly oiled baking sheet. Bake at 350˚ for 20 minutes. Cool and store in a closed container. Avocados (fruit, pip, and plant) are toxic to dogs. They can cause difficulty breathing; fluid accumulation in the chest, abdomen and heart; or pancreatitis. Onions destroy red blood cells and can cause anemia, weakness, and breathing difficulty. Even small amounts can cause cumulative damage over time. 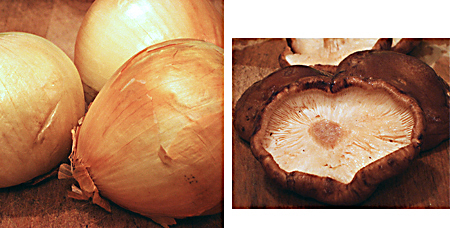 This includes onions or chives - raw, powdered, dehydrated, or cooked. Large amounts of garlic cause the same problems as onions. Grapes and raisins can cause kidney failure in dogs. As little as a single serving of raisins can kill him. If the dog doesn't eat enough at one time to be fatal, he can be severely damaged by eating just a few grapes or raisins regularly. Nutmeg can cause tremors, seizures and death. Caffeine (from coffee, coffee grounds, tea, or tea bags) stimulates the central nervous and cardiac systems, and can cause vomiting, restlessness, heart palpitations, and even death within hours. Diet products containing the sweetener Xylitol can cause a sudden drop in blood sugar, resulting in depression, loss of coordination and seizures. Unless treatment is given quickly, the dog could die. Macadamia nuts can cause weakness, muscle tremor and paralysis. These symptoms are usually temporary. Walnuts are poisonous to dogs. Chocolate can cause seizures, coma and death. Baker’s chocolate is the most dangerous. The darker the chocolate, the more dangerous it is. But any chocolate, in large enough amounts, can kill a dog. An ounce of chocolate can poison a 30-pound dog, and many dogs will happily consume more than this. The symptoms may not show up for several hours (and so might make you think all is well), with death following within twenty-four hours. A dog can consume milk chocolate and appear to be fine because it is not as concentrated, but it is still dangerous. Apple seeds, cherry pips, peach pips, pear pips, plum pips, peaches and apricot pips contain cyanide, which is poisonous. Too much salt can cause kidney problems. Also, large breeds of dogs that eat salty food may then drink too much water and develop bloat, which is fatal unless emergency treatment is given very quickly. Too much fat or fried foods can cause pancreatitis. Ham and bacon contain too much fat and too much salt, and can cause pancreatitis. Also, large breeds of dogs that eat salty food may drink too much water and develop a life-threatening condition called bloat. This is where the stomach fills up with gas and within several hours may twist, causing death. Raw liver or too much cooked liver (three servings a week) can lead to vitamin A toxicity. This can cause deformed bones, excessive bone growth on the elbows and spine, weight loss, and anorexia. Check the label of your canned dog food to be sure that it does not contain liver if you are giving your dog liver also. Wild mushrooms can cause abdominal pain, drooling, liver damage, kidney damage, vomiting, diarrhea, convulsions, coma, or death. Raw egg whites contain a protein called avidin, which can deplete your dog of biotin, one of the B vitamins. Biotin is essential to your dog’s growth and coat health. The lack of it can cause hair loss, weakness, growth retardation, or skeleton deformity. Raw egg yolks contain enough biotin to prevent the deficiency, so this is not a problem with raw whole eggs. Raw egg yolks could contain salmonella, so you should get your eggs from a reliable source or cook the eggs. Grains should not be given in large amounts or make up a large part of a dog’s diet, but rice is generally safe in small amounts. Cooked bones can splinter and tear a dog’s internal organs. Dogs can't digest most vegetables (carrots, green beans, lettuce, potatoes or yams) whole or in large pieces. Potato peels and green potatoes are dangerous. Dairy products are high in fat, which can cause pancreatitis, gas and diarrhea. A small amount of non-fat, plain yogurt is usually safe. Pennies made from the 1980s to today contain zinc, which can cause kidney failure and damage to red blood cells. A dog that consumes even one penny can become quite sick, or even die, if the penny is not removed. I made an unfortunate cake. It doesn't look bad. And it was not so bad that WE wouldn't eat it, but too bad to post the recipe. (The bad photo matches the cake.) 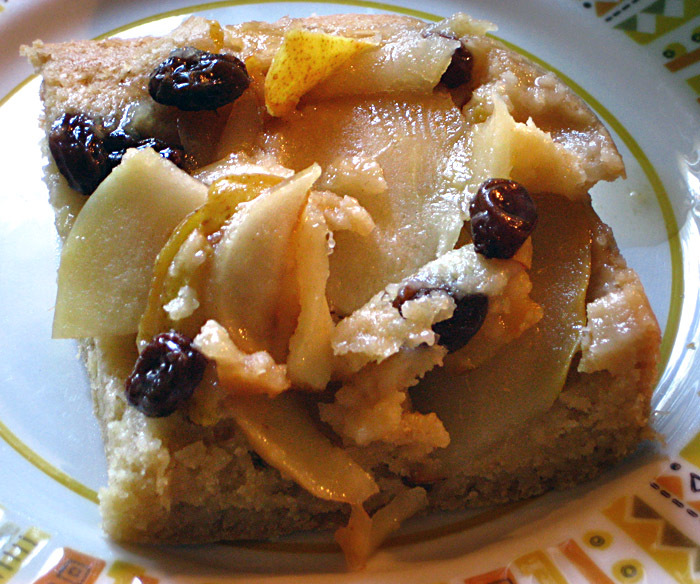 It was supposed to be a pear-apple-raisin up-side-down cake but the cake was hard, gummy and heavy — as if it had no leavening. And I know it had baking powder because I noted that we needed to buy more when I added it to the flour. I used my Japanese Benriner to slice the fruit, and the slices were so pretty that I was wishing I'd planned to make a fruit tart instead of an upsidedown cake so the slices wouldn't all be hidden. Since the cake turned out so poorly, this will be a post about helpful kitchen tools, instead of cake. In particular, my handy-dandy mandoline. I was quite taken by the beautiful pear shapes I sliced up to hide under the cake, and when the cake failed, I decided to focus on the mandoline instead of the dessert. In addition to the straight blade, there are three other blades that look like combs with variously spaced very sharp little teeth. Unfortunately, I'd never tried them! So for this post, I decided to finally see what they could do. First task was to get them inserted into the mandoline without the long-gone instructions. (Now I know what those two screws on the sides are for!) The main blade stays in place, and one of the "combs" inserts perpendicular to the blade. I was able to create three different cuts—very fine, medium and 1/4-inch matchstick. At first I thought the slices were just coming out as ... slices. But when I touched one, it divided into little strips. I did carrots, cucumber and zucchini. The Benriner, purchased at an Asian supermarket rather than a kitchenware store, is just about the cheapest mandoline out there. But in spite of its low cost, it's really a great piece of equipment. It comes in several varieties including a "super Benriner" which is a bit wider than the regular one. I recently sent my daughter-in-law a Borner V-slicer Pro as a gift. After doing a lot of internet research, I found myself influenced by all the stuff I'd read, and I wanted to get her something a little nicer than mine. This seemed to be the best choice for the cost and she seems to like it. However, for a basic, hard-working mandoline that is extremely reasonable in cost, the Benriner is not a bad choice. I know what you're thinking. Soup again? Is that all she eats? I really don't like to repeat myself and post variations of past recipes, but this was the best winter squash soup I've ever made. It just wouldn't be fair not to share the recipe, even if it is related to a recent post. I was having a "don't want to cook" night, and nothing seemed easy enough. My daughter-in-law e-mailed me a recipe for a butternut squash lasagna that she had just made but she couldn't convince me that it "wasn't any trouble at all." Yeah right. When non-vegans make lasagna they just have to scoop the ricotta out of a container. Vegans have to make the "ricotta." And there was the part about baking the squash and making the sauce. On and on. I thought lasagna was trouble BEFORE I was vegan, which is why it's usually served on special occasions and at potlucks when you're trying to show off. 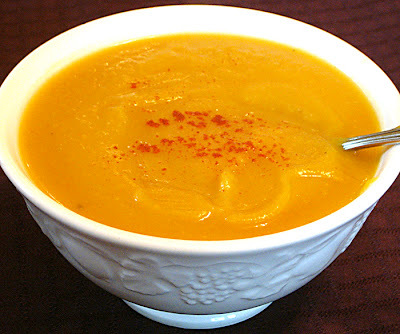 But the squash part reminded me that I could make a pressure-cooked soup without much effort. I hadn't planned to post about it since I had recently done that, but a few changes in the seasonings produced a result that surprised us with its fabulous flavor. I have to warn you that it was really spicy. Maybe even a little too spicy for me. I think I had smoke coming out of my ears, but my fire-eating son pronounced it the best soup he'd ever had. I used two delicata and one acorn squash but you can use any dry-fleshed squash like butternut or buttercup. Sauté the chopped onion in the pressure cooker until it softens and starts to brown. Remove to a small bowl. Cut the ends off the squash, split in half, remove seeds and cut into large pieces. Place in the pressure cooker with six (approximately) cups of water. Cook at pressure for five minutes. Bring pressure down quickly. Lift the squash out with a slotted spoon and place in a bowl to cool a little. When the squash is cool nough to handle, scrape the flesh out with a spoon and put the skin in the compost. Okay. My husband has many visiting scholars and foreign students visiting him on campus (he's a professor). Many of them are from Asia and they often bring him tea. We have this little can of tightly wound bundles of something that when placed in a tea infuser and steeped in a mug of hot water, look like this picture. 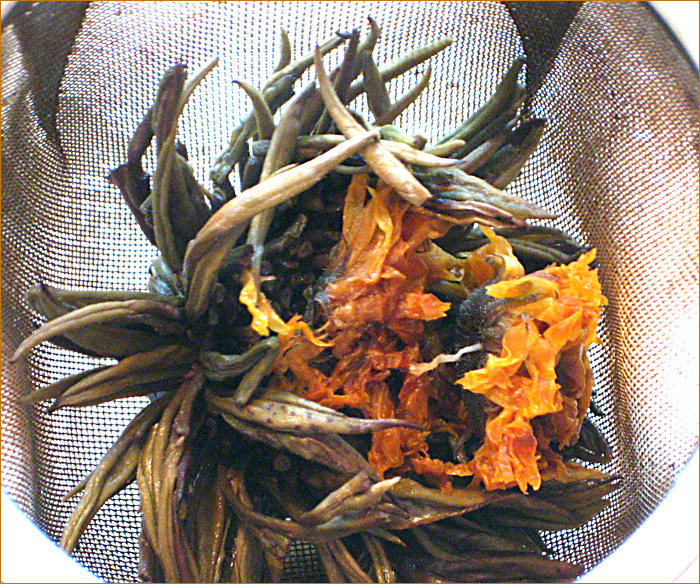 Any tea experts out there who know what it is? It's very flowery and delicious. I have a muffin recipe that's so old that many of the words are rubbed off and I've had to rewrite them on the back. I use it as a base recipe on which to build variations. The original was not vegan, and I've adapted and changed it over the years. In its current state, it acts as my starting point for whatever muffin I have in mind. I hunted it down when I started thinking about Thanksgiving and the fact that I still have cranberries from last year in the freezer, and I really should use them up before getting fresh ones. The freezer isn't that big but it does tend to become a den of antiquity, if you know what I mean. So I decided to make muffins - and store the extras in the freezer... . In addition to the cranberries, there are chocolate chips, and the combination is even better than I thought it would be. I don't think the extras will be around too long. This batter is stiffer than most muffin batters but the muffins themselves are tender and light. I've added a touch more sugar than I normally do, to balance the tangy cranberries, but they are still pretty low-fat and low-sugar compared to most recipes. I pop blobs of batter into the tins without worrying about the shape. They look like regular muffins when they are done but with a rough rather than smooth top. The recipe makes 12-15 delicious muffins, depending on how much batter goes into each cup. I tend to fill mine generously because they don't rise that much. Put the orange juice concentrate in a quart measuring cup and add enough soy (or other non-dairy) milk to make 1-1/3 cups. Add 1/4 cup oil and mix together. Stir or sift the flour to lighten it before measuring. In a large bowl, combine two cups flour, 1/3 cup sugar, 1/4 teaspoon salt and 1 teaspoon cinnamon. Mix well. Mix the baking powder into the flour mixture. Add the cranberries and 1/2 cup chocolate chips to the flour and mix well. Add the liquid to the dry ingredients and fold in quickly but thoroughly. Do not over mix. Fill lightly oiled muffin tins and bake in a preheated 400˚ oven for 18-20 minutes or until done. Here's a little bonus variation since I still had cranberries left over. These were big, gorgeous cranberries by the way. They were purchased fresh from a grower at the indoor winter farmer's market last year. They looked like glowing jewels, and I was tempted to just let them stay in the freezer a bit longer, but Thanksgiving is just around the corner and it's time for a new crop. These muffins also have crystallized ginger bits for a spicy-sweet bite. Put the orange juice concentrate in a quart measuring cup and add enough rice (or other non-dairy) milk to make 1-1/3 cups. Add 1/4 cup oil, 1/4 teaspoon vanilla and mix together. Stir or sift the flour to lighten it before measuring. In a large bowl, combine one cup flour, one cup cornmeal, 1/3 cup sugar, 1/4 teaspoon salt and 1 teaspoon cinnamon. Mix well. Mix the baking powder thoroughly into the flour mixture. Fall weather always makes me crave creamy soups. Maybe it's because they're so comforting and I need reassurance to face the long winter ahead. Whatever the reason, my youngest son and I decided to cook together, and the menu was to be soup and sweet potato fries. Because we are eating from our CSA box, and because our farmer loves to grow purple cauliflower, that's what I used for the soup. I was more than a little skeptical about what it would look like—I'm used to creamy white cauliflower soup—but game. I cooked it in my pressure cooker, and even though I knew I was cooking a purple cauliflower, when I opened the pot I was still surprised to see deep purple liquid and lavender cauliflower pieces. I went at it with the immersion blender, and it blended into a nice shade of purple. The next surprise came when I added fresh squeezed lime juice (we have a lot of limes from our CSA fruit share) and as the juice hit the purple, it turned a bright magenta. This was getting interesting. I tasted and seasoned and wrote down approximately what I did. We ended up with a great tasting pot of weird looking soup. Jordan made our usual oven sweet potato fries, with the addition of spicy chipotlé powder, and they were superb. In fact, we ate them before I remembered the camera! Sauté the onion and celery in a small amount of olive oil in the pressure cooker until the onion is translucent. Add the cauliflower and potato and enough water to come about 3/4 up the cauliflower. Bring up to pressure, turn the heat down and cook at pressure for 4 minutes. Run cool water over the lid to bring the pressure down. Open the pot and add the miso, lime juice and oil. Blend in the pot with an immersion blender, or in batches in a conventional blender. Stir in the garlic. Adjust seasonings. Garnish. I used baby arugula because that's what I had on hand. As soon as I saw Maureen's post about pierogi, I knew I was going to have to make some. In fact, you might say I became a little obsessed. She claimed Ukrainian ancestry and I claim Russian. Either way, these dumplings make great eating. Back in the days when I was young, and before I became lazy, I used to make my own noodles on a regular basis. I had, (and still have—somewhere) a hand crank Atlas pasta machine. Mostly the noodles were really successful, but there is one horror story that pops into my head when I contemplate stuffed noodles. It involved a very large dinner party and homemade ravioli assembled before the guests arrived, and stacked in a big bowl. Of course, the ravioli stuck together and turned into one massive bowl-shaped noodle. I'll let you imagine the poor frantic hostess salvaging what she could ... And I can't help thinking about the leftover pirogi in the refrigerator dish as I write this. But, of course, they are cooked and not sticky ... Right? I followed Maureen's dough recipe with the following exceptions. I used white whole wheat flour instead of all-purpose, and I used two teaspoons of salt instead of two tablespoons. Also, instead of rolling out the dough and cutting the circles the traditional way, I took small pieces of dough and rolled each into a circle like I would a tortilla or chapatti. I rolled them pretty thin and made each circle about 4 to 5 inches in diameter. I had some leftover Bolivian cabbage and potatoes that I made into a filling. I sautéed three chopped onions and eight ounces of mashed-up tofu until it started turning brown, and mixed it with the cabbage and potatoes. If I hadn't had the leftovers, I might have sautéed shredded cabbage to mix with the onions, or baked some potatoes to mash with the fried onions. pierogi happily boiling at the water surface, refusing to sink. I boiled the dumplings five at a time in a big stock pot of water for 10 minutes. I guess they are supposed to sink and then rise to the surface when done, but mine never sank, thus the timer. I made at least two dozen good-sized dumplings before I ran out of filling, and still had a chunk of dough left over that I'll probably make into noodles. (I ran out of patience long before the filling ran out, but that's another story.) I guess my dumplings don't look like "real" pierogi but so what. They were good, good, good! Thanks, Maureen. I seem to be on some sort of carb-fest lately. Here's a glimpse of another item I've recently cooked. I used the last of my refrigerated no-knead bread dough to make a mushroom pizza with vegan cheese. The dough had been in the refrigerator almost two weeks and developed a nice sourdough tang which bumped up the flavor. Ever since I roasted our garden tomatoes and made ranchero sauce, I've been using Muir Glen fire roasted crushed tomatoes instead of plain ones. I actually used them straight from the can for the pizza with just a drizzle of olive oil and a sprinkle of oregano. Using roasted tomatoes makes a big flavor difference. A very strange thing happened. 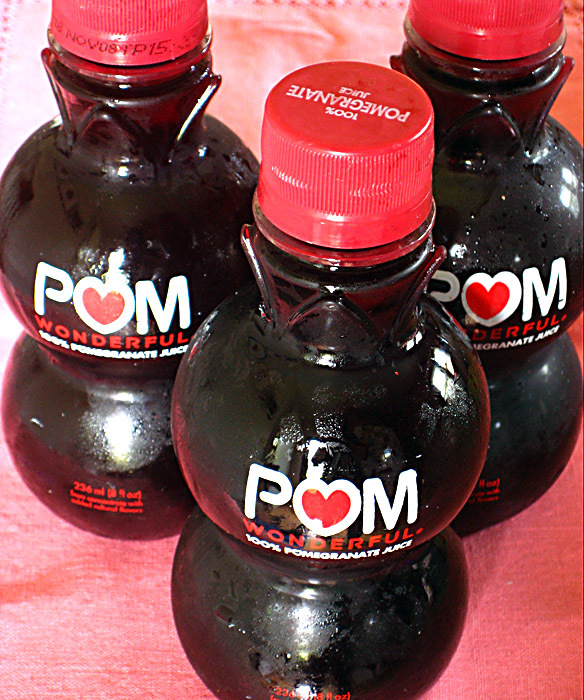 The blogger representing the company that produces Pom Wonderful pomegranate juice e-mailed me and offered to send me coupons to try their products. The person liked my blog and my efforts to offer healthy cooking ideas. I agreed to receive the coupons and sample the juice. I came home from work a few days later and noticed a shipping carton in our hallway but couldn't remember ordering anything. After I'd unwound a little from the workday, I took a look at the carton. Imagine my surprise to find a case of pomegranate juice inside! Eight eight-once bottles of garnet-colored juice. The literature accompanying the bottles says it has more antioxygens than just about anything else. So while my husband had his glass of wine, I sipped my bottle of Pom. It's delicious, too. I wish they'd send me another case! I've never entered a blog challenge before, but this No Croutons Required event on Tinned Tomatoes caught my attention. It's for soups or salads involving pasta, with an eye to comforting dishes to ward off the chilly weather ahead—or already here depending on where you live! Now some people might consider mac and cheese their comfort food, and others (misguided others?) may name meatloaf, but when I think of comfort food for cold weather, I think of kasha and bowties, or kasha varnishkes. Just the sound of the word "kasha" makes me think of blazing fireplaces and cozy sweaters — and my warm and wonderful grandmother. And bowties just seem thicker and mouthier than regular noodles, with a chewy twist in the middle of each one. Traditionally, in Russia, kasha means porridge and can be made from any whole grain or combination of grains. To me, it means buckwheat groats, and kasha varnishkes is buckwheat and noodles, specifically bowtie noodles. Kasha varnishkes is a traditional comfort food brought to America by Russian Jewish immigrants. Buckwheat is actually the seed of a fruit, not a grain. (You can read all about buckwheat and its possible appropriateness in gluten-free diets here.) It is very nutritious, delicious and quick cooking. Hulled, raw buckwheat is called buckwheat groats, and that's what I'm starting with in this recipe. After it's toasted in oil, it's called kasha. I've never encountered it in a soup before but thought I'd give it a try. Cook noodles according to package directions, drain and set aside. In a five quart Dutch oven sauté the sliced onions, carrots and mushrooms in two tablespoons of oil until onion is soft, about five minutes. Push the onions aside and add the paprika, garlic and buckwheat to the pan. Cook, stirring, until buckwheat is fragrant. If the pan is dry, you can add a little oil. Add the 6 cups of water or stock, and return to boil. Reduce heat to simmer, cover, add tamari and cook 12-15 minutes until buckwheat is tender. Add noodles. Add green onions, reserving some to sprinkle on each serving. Add a few grinds of pepper and additional salt if desired. Not only did this soup meet my expectations as a comfort food, the whole house smelled fantastic for hours. We had this soup with teeny tiny steamed brussels sprouts and imaginary muffins. Next time real muffins! I was trying to clear out the refrigerator and make room for a new fruit share box and I was staring at a bag of red plums at the point of use 'em or loose 'em. When we signed up for a bi-weekly fruit share from our CSA, we didn't realize what we were getting into. We already split a veggie share with friends and we each take a box on alternate weeks, so it seemed we'd be able to use up the fruit in two weeks. Not so. We eat a LOT of fruit but it's never enough. With the plums, I meant to make a batch of plum and apricot chutney, but just plum forgot all about it. (sorry) As I looked at the bag, all I could think of was apple crisp made with plums. I should have looked on the Web for ideas but that would have meant another trip upstairs, so I just went at it, hoping for the best. I did keep track of what I did—pretty basic but really delicious. Lay the plum halves cut side up in a large baking pan. Sprinkle with two tablespoons sugar, two tablespoons spelt flour and 1 teaspoon cinnamon. In a medium sized bowl, mix together the rolled oats, sucanot,spelt flour, cinnamon and salt. Cut in the margarine with a pastry blender (if you have such a thing) or two knives (or your clean fingers) until it looks like bread crumbs. Spread the topping evenly over the plums. Bake in a preheated 375˚ oven for about 40 minutes or until the plums are soft. If the topping starts to get too brown, cover with a sheet of foil.